Franklin Youth Baseball was honored to present this year’s scholarships to four outstanding young men. Three FYBO scholarships ($750 each) were given to Joseph Clark, Tyler Langevin, and Jason Collins. 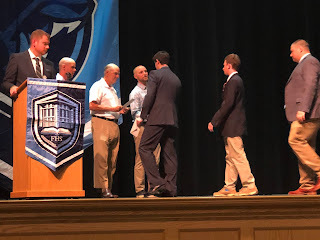 The Bill Capen Memorial Scholarship ($1,000) was awarded to Brendan Ryan. Congratulations and best of luck in the future.